This interesting and unusual name takes its origin from two places in Bedfordshire and Northamptonshire called Harrrowden. In the Domesday Book of 1086 this is first recorded as "Hergentone", and the derivation is from the Old English pre 7th Century "Learg(a) (pagan) temple and "dun", hill so the meaning of the name would be "one who lives at (or by) the hill of the pagan (heather) temple. Regional and dialectual differences have produced variations in the spelling of the name. 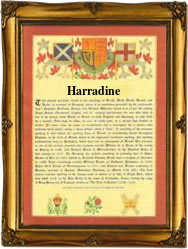 In the modern idiom, it can be spelt Harradence, Harradine, Harridine, or even Horoden. "Alice Harrodon was christened at Southill, Bedfordshire on January 10th, 1541 while Ann, daughter of John and Mary Harradine was christened also at Southill on July 25th 1765. A notable namebearer Richard Harraden (1756 - 1838) published views of Cambridge in 1797 and "Costume of the various orders in the University, in 1803". The first recorded spelling of the family name is shown to be that of William de Harewedon, which was dated 1327, The Subsidy Rolls of Sussex, during the reign of King Edward 11, "Edward of Caernafon", 1307 - 1327. Surnames became necessary when governments introduced personal taxation. In England this was known as Poll Tax. Throughout the centuries, surnames in every country have continued to "develop" often leading to astonishing variants of the original spelling.